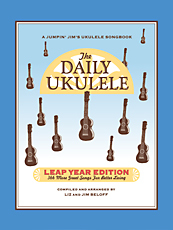 Compiled and Arranged by Liz and Jim Beloff, The Daily Ukulele: Leap Year Edition features 366 more well-known songs arranged for ukulele in a 9X12 format. Like the first Daily Ukulele songbook, all arrangements feature melody, lyrics and ukulele chord grids in uke-friendly keys, perfect for groups of one or one hundred. This collection includes popular songs from the 1950s, 1960s, 1970s, 1980s, right up to today. You’ll find hits by Carole King, Elton John, Bee Gees, Stevie Wonder, The Beatles, Paul Simon, Bob Dylan and Michael Jackson…plus Motown classics, folk songs, Broadway showstoppers and great Hollywood movie themes. It also features a “Ukulele 101” section, a chord chart and vintage ukulele-themed photos throughout. The Daily Ukulele: Leap Year Edition offers ukulele fun all year long–even on February 29th! 416 Pages.